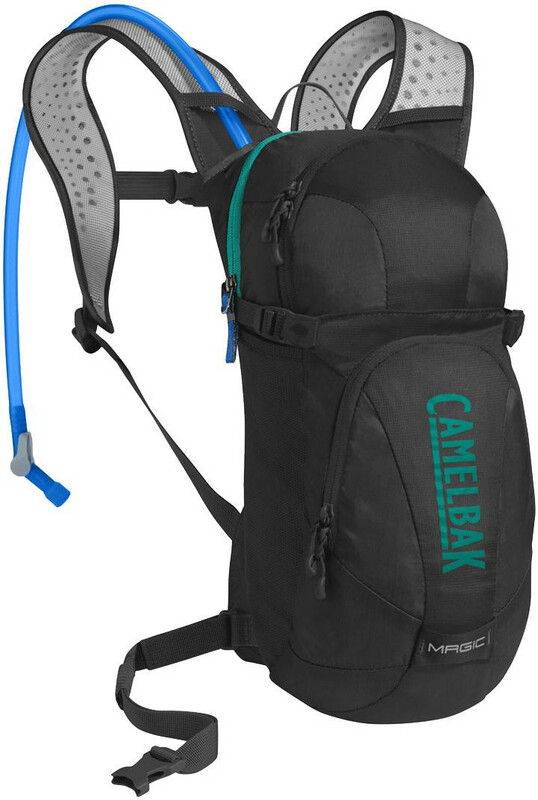 CamelBak: Weighing in at just one pound, the Magic™ is ideal for days when the weather is clear and the trail is calling—days when you want to ditch most of your gear to travel fast and light. With 2 liters of hydration capacity, it carries enough water for a substantial 2+hour ride. There are universal hooks for carrying your helmet, plus a zippered front that pocket leaves enough room for a phone, card, and keys. The removable waist belt also adds stability on rough terrain. The updated Magic features another full-length pocket for your bike pump and a magnetic tube trap that stows your drinking tube in one easy click. And as always, the women’s-specific design features S-curved straps and a shorter pack length for a closer, more comfortable fit. PACK ONLY WEIGHT: 390g / 0lb 13oz TORSO FIT RANGE: 38-52cm / 15-21 in WAIST FIT RANGE: 66-116cm / 26-46 in FABRIC: 100D Robic Nylon Dobby / 210D Nylon Oxford FEATURES: • Crux delivers 20% more water per sip, with an ergonomic handle for easier refilling, and an on/off lever that makes it easy to prevent leaks. • Magnetic Tube Trap™ keeps your tube secure and accessible when you need it. • Air director back panel offers air channels to keep your back cool. • External hooks let you carry your helmet while still allowing full access to your pack. • Stretch overflow storage compartment lets you easily stash a rain shell or extra layer. • Reflective accents for visibility in low-light environments. • Removable stability belt helps to keep pack secure over technical terrain. • Women's-specific design features a shorter back panel and an S-curved harness for a closer fit.